The best elliptical reviews descriptions in the world won’t do you any good if you aren’t familiar with the basic machine. That is why we’ve put together this handy guide for the most important components on an elliptical trainer. Let’s start with one of the most important parts – the flywheel. This component is responsible for the resistance you feel when you try to power an elliptical with your legs. As your legs move, the flywheel spins in response. A flywheel is usually going to be described in terms of how many “pounds” it equals. In general, heavier flywheels are better and provide a smoother elliptical motion. The weight of a flywheel also helps determine the noise level and longevity of the machine. For comparison, an elliptical with a light flywheel is going to be chopping, uneven, and perhaps noisy. These less expensive models are often made of cheap components with limited warranties. While the price may be attractive, the quick breakdowns make these risky options. Flywheel weights usually range from 11 to 35 pounds. Our top-rated machines mostly exceed 18-20 pounds so that’s a good benchmark to aim for. Flywheels work because they encounter magnetic resistance as they spin within a magnetic field. Resistance is created by adjusting the distanced of magnets on a caliper to the magnets of the flywheel. When the magnets are closer to the flywheel, there is a higher resistance on the machine. The distance can be controlled by a motor or by hand. Some high quality machines use eddy current brake systems with no moving parts. This type of machine is very low maintenance and dependable. They are also very accurate and quiet machines. These eddy current systems are preferable to motorized or manual systems. The position of the flywheel is going to determine whether you have a front-drive, center-drive, or rear-drive machine. 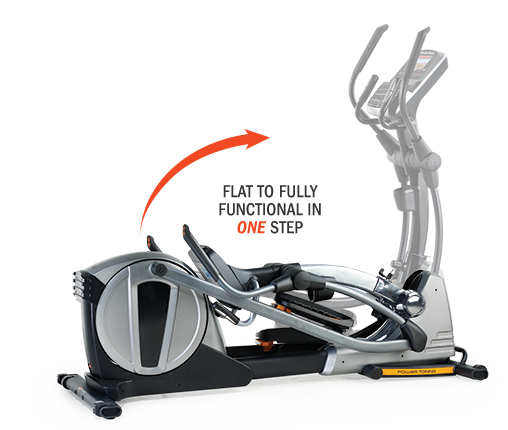 Front drive ellipticals like the ProForm Endurance 920E tend to be a bit smaller in size. The ACT Commercial 10 from NordicTrack is a great example of a center drive machine with the flywheel centered beneath the foot pedals. Center drive machines have very compact footprints and can be a great fit for people with smaller homes. Finally, a flywheel on the back of the elliptical creates a rear drive machine. Some of the first ellipticals were rear drive machines and they provide some of the smoothest and natural-gaited motions. On the downside, rear drive machines also tend to take up the most space. Luckily models like the NordicTrack SpaceSaver SE9i are designed to fold up for easier storage. The foot pattern varies slightly with each of these drive types and also across brands. Try a few machines at the gym and get a feel for which configuration would work best for your needs. 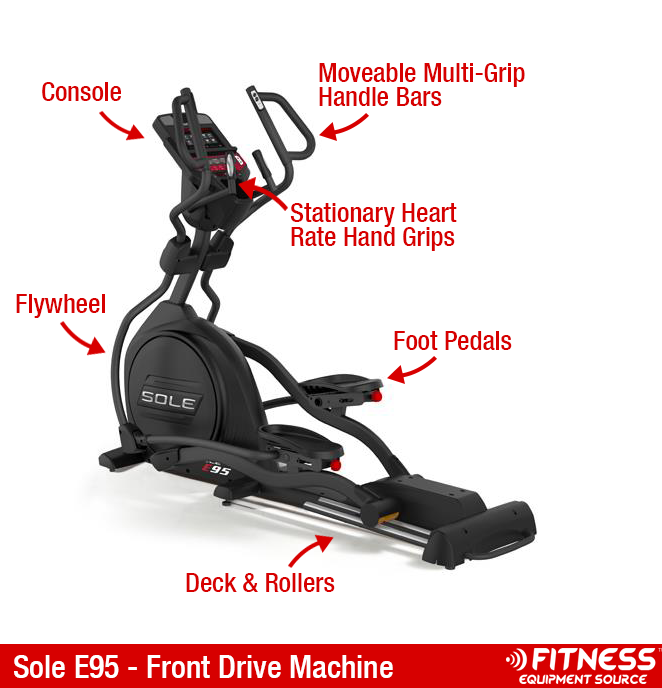 Moving right along – it’s time to take a look at the foot pedals on your new elliptical. The wrong foot pedals can cause anything from shin splints to lower back pain, so it’s worth learning about the options. Foot pedals will be described in terms of their size, cushioning, tread, positioning, and movement. Many brands will advertise that that they have ‘oversized’ foot pedals with tread to keep your feet in place while you operate the machine. Sometimes brands will purposely provide an inward slant on their pedals to help reduce stress on the knees. The Sole E55 is a great example this. Articulating pedals will move slightly to allow more movement of the ankles. This is a good feature to have to help avoid toe numbness during workouts. Finally, adjustable foot pedals can be a great idea so you can move the pedals into the perfect position for your particular preferences. Unless you are using a suspension elliptical, your pedals are going to operate with the use of rollers and rails. Wheel rollers slide forward and backward on rails, which are can also be referred to as the ‘deck.’ Poorly designed decks and rollers are a common source of noise on a machine and may require rail lubricant. Some machines will have a single set of wheels moving along a single rail while others will employ a double wheel and rail system. Sole Fitness is a great example of a company that has solid double wheel design for more stability. You should pay special attention to the length of the rails on which the wheels roll. This is going to determine the stride length on your machine. Stride lengths typically fall between 14 to 24 inches and can make a huge difference in the quality of your workout. Ellipticals with a stride length less than 16-inches tend to feel choppy with a stepping motion. The ideal stride length is going to depend a bit on your body size and height. A tall person on a short stride length machine is going to feel cramped. A short person on a machine with too long of a stride length may experience lower back pain over time. Ideally, you should look for a machine that either matches your stride length needs, or has adjustable stride length to work for multiple users. Finally, look for a stride length where your hips can stay level instead of shifting side to side. Ellipticals can have two different kinds of heart rate monitoring. Almost all machines will have hand grips that you can hold on to find your current heart rate. These often are stationary on the front of the machine. Since you need to hold onto them constantly for regular heart rate updates, they prevent you from getting the upper body benefits of gripping the moveable handlebars. Machines can also wireless heart rate monitoring if the machine can communicate with a wireless heart rate belt. This is ideal because it gives you an ongoing and accurate readings of your heart rate while you work out. Knowing your heart rate while you work out can be a powerful tool for athletes. Heart rate control (HRC) programs on the elliptical can help you stay within your desired heart rate range during workouts. Not all ellipticals have this features, so if you are interested in monitoring your heart rate, be sure to look for this type of programming. Some ellipticals are going to have very basic programming. This might consist of a simple LED display showing time, distance and resistance. Other machines are going to have so many bells and whistles that your head spins. Built in workout programs can be great tools to help you get more out of your workouts. Typical programs include things like Fat Burn, Intervals, and Heart Rate Control. A few brands have some specialized features that are well worth a look. 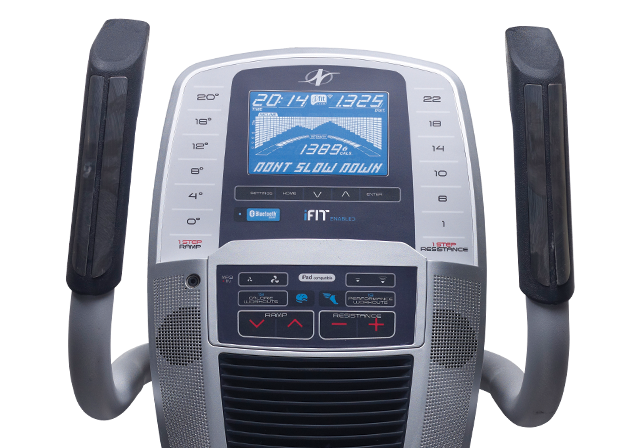 For instance, Horizon ellipticals are built with ViaFit, which is a virtual fitness tracking program that integrates with your existing fitness apps. You can link ViaFit to your MyFitnessPal account or MapMyRun. With this integration, you will be able to track your elliptical workouts, set goals, and take control of your progress. Another extremely popular program is iFit Live on ProForm, NordicTrack, and several other smaller brands. iFit Live lets you get personalized coaching from trainers like Jillian Michaels. It also lets you sync with Google Maps or exercise in interesting virtual locations around the world with an image displayed on your screen. Yowza Fitness has MyLiveLight which links to a smart scale. This system lets you monitor your weight from day to day. The program will create a custom workout based on your need to gain, lose, or maintain weight. Sole Fitness is one of our top recommended brands. They have Bluetooth Advantage so their machines are able to link to a free Sole Fitness smart app or other popular apps like FitBit, UnderArmour, or Apple Health. One of the main advantages in an elliptical over a regular treadmill lays in the handlebars. By pumping your arms as you move, you will be able to achieve a better upper body and core workout when compared to using your legs alone. Most machines will have handle bars that go simply forward and backwards. 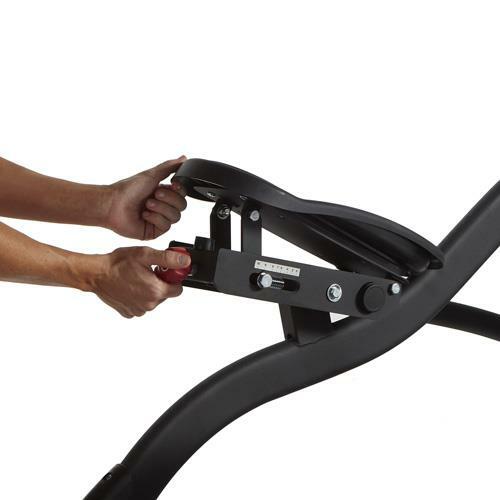 Single grip handle bars are straight bars with only one gripping surface. Multi grip bars are usually shaped like a big loop or two prongs with more hand grip options. You may also find handle bars with built in buttons to adjust incline or resistance. This is a great feature to have so you don’t need to stop your motion to reach down to the regular console controls. If you are interested in another option, you can also try the Cardio Core machines from Yowza Fitness. These machines using a twisting motion that is great to exercise your core. If you have any additional questions for our team, feel free to comment below. Hopefully this guide gives you a basic idea of the parts and features you should look for when you are elliptical shopping.